The clerk of the state House of Representatives on Wednesday barred live television coverage of an afternoon session at which the speaker was elected after a two-month struggle among House Democrats. Associated Press. State House Speaker Calvin Say yesterday overcame a leadership challenge that had divided majority Democrats for two months, but he agreed to give dissidents a greater share of leadership posts and committee chairmanships. Star-Advertiser. State Senate president Shan Tsutsui set the stage for the 2011 Legislature, saying lawmakers will tackle the economy, education and energy self-sufficiency. Hawaii News Now. The state House on Wednesday afternoon had a leader after a public dispute over who should be speaker. KITV4. 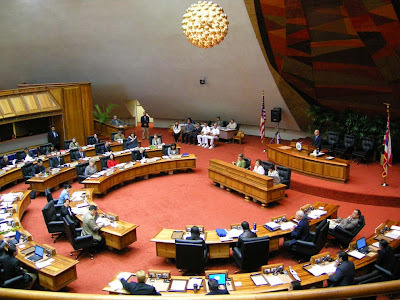 Rep. Calvin Say (District 20 – St. Louis Heights, Palolo Valley, Maunalani Heights, Wilhelmina Rise, Kaimuki) will remain as Speaker of the House for the Twenty-Sixth Legislature, which includes the 2011 and 2012 legislative sessions. Hawaii News Now. For two and a half months, Calvin Say could not muster the required 26 votes to win another two-year term as speaker of the Hawaii House of Representatives. Civil Beat. The 26th State Legislature conducted its opening day festivities with music and song today. At the same time there was a cloud of uncertainty and tension in the lower House due to unsettled differences. Hawaii Public Radio. 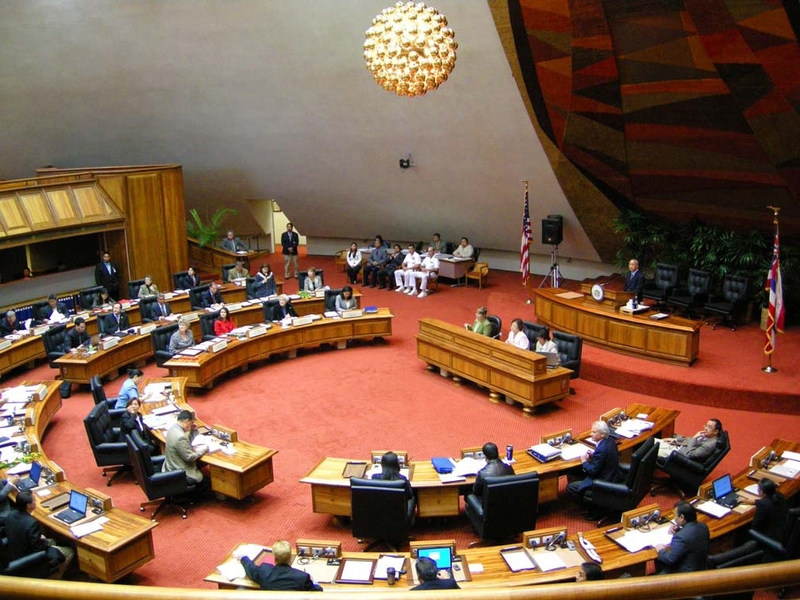 The Hawaii House of Representatives today announced that Rep. Calvin Say (District 20 - D)will remain as Speaker of the House for the 26th Legislature, which includes the 2011 and 2012 legislative sessions.Hawaii Independent. Governor Neil Abercrombie today appointed of Georgette “Jo” Jordon to represent House District 45. Jordon fills the seat left vacant by Maile Shimabukuro who was appointed to the district’s State Senate seat. KHON2. U.S. Rep. Colleen Hanabusa has been appointed to House committees that handle military and environmental policies. Associated Press. A scientist from the University of Hawaii has helped discover 16 pairs of supermassive black holes in merging galaxies. Star-Advertiser. The Quiksilver In Memory of Eddie Aikau could go. Star-Advertiser. While some are planning for the possibility of damage from huge surf scheduled to arrive early Thursday morning, many more are looking forward to just seeing the beauty and power of these big waves. KITV4. To help alleviate traffic congestion and protect public safety, the city and event sponsor will provide off-site parking and bus transportation if the Quiksilver In Memory of Eddie Aikau big wave surf contest is held soon at Waimea Bay. Hawaii News Now. Dark now, but with 30 foot surf expected to pound the coast, the City is prepared at a moments notice to activate if necessary. KHON2. Federal and state officials on Wednesday asked Hawaii boaters to help them search for an entangled humpback whale that's dragging about 60-to-80 feet of line and a buoy. Associated Press. The road to the summit of Haleakala reopened at 11 a.m. Wednesday after being closed earlier because of snow, slush and ice on the roadway, a park official said. Maui News. With two new interventional cardiologists on staff, Maui Memorial Medical Center recorded its first angioplasty just three days into the new year. Maui News. A South Kohala developer is still in violation of a Land Use Commission decision, state planning officials say. West Hawaii Today. A Makaha Valley Towers condominium owner who used a baseball bat to bludgeon a peacock to death should not be on trial because peafowl are pests and the state doesn't require a permit to kill them, her attorney told jurors yesterday. Star-Advertiser. KITV 4 News has learned an elementary school secretary was arrested in a theft case Wednesday, the same day a Kapolei man was sentenced after he admitted to stealing thousands of dollars from a Little League baseball team. KITV4. Fire Chief Darryl Oliveira said he'll consult with county Corporation Counsel Lincoln Ashida before taking any action concerning a Pahala fire captain convicted of a 2005 hit-and-run death. Tribune-Herald. Opponents to Honolulu’s rail transit project say the city’s clearing of a key Federal Transit Administration hurdle won’t stop them from trying to derail the program. Hawaii Reporter. With Honolulu's Rail Transit Project cleared for construction, job-seekers lined up today hoping to score one of the thousands of rail-related jobs. KHON2. Residents have been turned away at the propane pump in recent weeks, left without needed fuel for stoves and other home appliances. Garden Island. An army has to train if it wants to avoid unnecessary casualties. And American troops stationed in Hawai'i face a narrowing set of options for training. Kaho'olawe has been returned, much the worse for wear, to the native Hawaiians. Big Island Weekly. Homeowner watches as lava overtakes house. Star-Advertiser. Longtime Molokai rancher James “Uncle Jimmy” Duvauchelle has been managing land on Molokai’s west end for 40-plus years – seeing the island turn from green to brown and the economy dwindle.. Molokai Dispatch. A 32-year-old Kealakehe Intermediate School teacher, recently charged with abuse and unlawful imprisonment of a child, has been put on indefinite "department directed leave," school officials said Tuesday. West Hawaii Today. The Kaua‘i Fire Department is inviting public comment on the relocation of the Kekaha lifeguard tower. Garden Island. If you haven’t noticed, we’re in a full-tilt transformation away from conventional cars. Honolulu Weekly.